Capital of the government of Courland, Russia; situated about 20 miles from Riga on the Drixa, an arm of the River Aa. The castle of Mitau was founded by the German Knights in 1263; and the town itself received its charter in 1435. Under the rule of the Knights, Jews were not permitted to reside in Mitau. In the sixteenth century, when Mitau was already Polish territory, Jewish merchants carried on a more or less extensive business in the city; yet even then they were not recognized as permanent residents, and they had not the right to organize a community; and in the next century, after the Cossacks' uprising (1648), the Christians of Mitau finally caused their expulsion from the city. The Jew Bär ben ha-Ḳadosh Rabbi Benjamin, whose father was killed in Lithuania during the Cossacks' uprising, was court jeweler (1730) under Duke Ferdinand, and stood high in the esteem of the Knights. He made numerous gifts to the Jewish community, among them a funeral carriage and a coffin, which were still preserved in the middle of the nineteenth century. A concession for a cemetery was granted in 1730 to the Jews of Mitau by the duke on the application of their representative Isaac ben Judah; and a ḥebra ḳaddisha was founded in the same year. Ẓebi Hirsch Ḥarif (d. 1738), son of Rabbi Moses of Lemberg, and an eminent Talmudic scholar, acted as rabbi of the community. Duke John Biron, Ferdinand's successor (1737), was friendly toward the Jews and transacted business in partnership with his court Jew Lipman (Levi). At that time there was a considerable number of Jewish residents in Mitau; under the name of "Schutzjuden" they lived in a separate quarter called the "Judengasse," now the Doblen'sche Strasse. The Jew Meyer Kreslawe was given permission to open a Jewish inn in the center of the city. This was known as "Hotel de Jerusalem." It still existed in the middle of the nineteenth century, being then owned by H. Michelsohn. The successor of Ẓebi Hirsch Ḥarif was another prominent rabbi, Samuel ben Elkanah (d. 1742), author of the responsa collection "Meḳom Shemuel." He was probably followed by Jekuthiel ha-Kohen (d. 1775), father of Raphael ha-Kohen of Hamburg, and a descendant on his mother's side of Mordecai Jaffe, author of the "Lebushim." He held the title "Rabbi of the Province of Livland." His son David Ezekiel Jekuthiel (d. 1823) succeeded him as rabbi of the community. When Duke Ernst Biron was banished to Siberia in 1741, the knights of Courland attempted to expel the Jews from Mitau; and in 1760 the Diet passed a resolution forbidding Lithuanian and Polish Jews to sojourn in Mitau for more than a day or two (see Jew. Encyc. iv. 312b, s.v. Courland). With Biron's return from exile in 1762 the condition of the Jews improved; and his son and successor, Duke Peter, was also favorably inclined toward them. In 1784 a prominent Jew of Mitau, Kalman Borkum, laid the foundation of a synagogue, which was erected entirely at his expense. Both he and his brother Samson were very active in promoting the welfare of the Mitau community, and were strenuous champions in defense of the rights of the Courland Jews against the German merchants. The son-in-law of Kalman Borkum, Dr. Elrich (d. 1809), was a native of Russia, and came to Mitau (1770) from Vilkomir, Lithuania, where he had practised as government and city physician and had received the title of court councilor. Markus Herz, husband of Henriette Herz, visited Mitau in 1775. Judah ben Mordecai ha-Levi Hurwitz, a prominent physician and scholar, practised medicine in Mitau for a time. Notwithstanding the influence of prominent Jews at court, and in spite of the liberal views introduced from Berlin into German Courland, the Jews of Mitau did not enjoy the rights accorded to the Christians, and often suffered from official abuses and from the enmity of the German merchants. This is evident from the fact that in 1795 the members of the Jewish community of Mitau submitted a memorandum to the knights of Courland assembled at the Diet, in which they gratefully acknowledged the protection hitherto extended to them, andasked for relief from their uncertain legal condition. The petition was signed by the elders Aaron Lipman and Isaac Moses Eides and by other prominent Jews representing the community. Among the latter were David Levi, Joseph Sholem, Joseph Kirschner, Marcus Jacob, Marcus Hirsch, Simon Abraham, and Abraham Danziger. In reply to this petition to the Diet submitted Jan. 13, 1795, the duke expressed an opinion favorable to the proposal that Jews be permitted to settle in Courland. However, before the duke had an opportunity to act in regard to the Jews, Courland was annexed to Russia (March 16, 1795). Catherine II., also, was very favorably disposed toward the Courland Jews, some of whom were among the early Jewish residents in St. Petersburg. When Emperor Paul visited Mitau in 1797, representatives of the Jewish community were received by him in audience. In 1810 the Empress of Russia gave an audience to a Jewish deputation, and appointed Bär Seelig Klein and Samuel Kandauer as court factors. By a ukase of May 12, 1797, the Jews of Courland received the same rights as the Jews of Lithuania and Poland. Their privileges were further extended by Alexander I. in 1805. 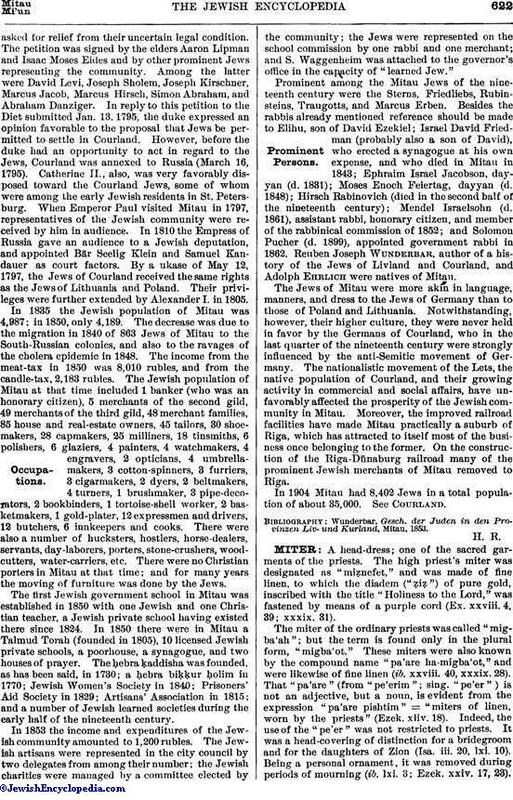 In 1835 the Jewish population of Mitau was 4,987; in 1850, only 4,189. The decrease was due to the migration in 1840 of 863 Jews of Mitau to the South-Russian colonies, and also to the ravages of the cholera epidemic in 1848. The income from the meat-tax in 1850 was 8,010 rubles, and from the candle-tax, 2,183 rubles. The Jewish population of Mitau at that time included 1 banker (who was an honorary citizen), 5 merchants of the second gild, 49 merchants of the third gild, 48 merchant families, 85 house and real-estate owners, 45 tailors, 30 shoemakers, 28 capmakers, 25 milliners, 18 tinsmiths, 6 polishers, 6 glaziers, 4 painters, 4 watchmakers, 4 engravers, 2 opticians, 4 umbrellamakers, 3 cotton-spinners, 3 furriers, 3 cigarmakers, 2 dyers, 2 beltmakers, 4 turners, 1 brushmaker, 3 pipe-decorators, 2 bookbinders, 1 tortoise-shell worker, 2 basketmakers, 1 gold-plater, 12 expressmen and drivers, 12 butchers, 6 innkeepers and cooks. There were also a number of hucksters, hostlers, horse-dealers, servants, day-laborers, porters, stone-crushers, wood-cutters, water-carriers, etc. There were no Christian porters in Mitau at that time; and for many years the moving of furniture was done by the Jews. The first Jewish government school in Mitau was established in 1850 with one Jewish and one Christian teacher, a Jewish private school having existed there since 1824. In 1850 there were in Mitau a Talmud Torah (founded in 1805), 10 licensed Jewish private schools, a poorhouse, a synagogue, and two houses of prayer. The ḥebra ḳaddisha was founded, as has been said, in 1730; a ḥebra biḳḳur ḥolim, in 1770; Jewish Women's Society in 1840; Prisoners' Aid Society in 1829; Artisans' Association in 1815; and a number of Jewish learned societies during the early half of the nineteenth century. In 1853 the income and expenditures of the Jewish community amounted to 1,200 rubles. The Jewish artisans were represented in the city council by two delegates from among their number; the Jewish charities were managed by a committee elected by the community; the Jews were represented on the school commission by one rabbi and one merchant; and S. Waggenheim was attached to the governor's office in the capacity of "learned Jew." Prominent among the Mitau Jews of the nineteenth century were the Sterns, Friedliebs, Rubinsteins, Traugotts, and Marcus Erben. Besides the rabbis already mentioned reference should be made to Elihu, son of David Ezekiel; Israel David Friedman (probably also a son of David), who erected a synagogue at his own expense, and who died in Mitau in 1843; Ephraim Israel Jacobson, dayyan (d. 1831); Moses Enoch Feiertag, dayyan (d. 1848); Hirsch Rabinovich (died in the second half of the nineteenth century); Mendel Israelsohn (d. 1861), assistant rabbi, honorary citizen, and member of the rabbinical commission of 1852; and Solomon Pucher (d. 1899), appointed government rabbi in 1862. Reuben Joseph Wunderbar, author of a history of the Jews of Livland and Courland, and Adolph Ehrlich were natives of Mitau. The Jews of Mitau were more akin in language, manners, and dress to the Jews of Germany than to those of Poland and Lithuania. Notwithstanding, however, their higher culture, they were never held in favor by the Germans of Courland, who in the last quarter of the nineteenth century were strongly influenced by the anti-Semitic movement of Germany. The nationalistic movement of the Lets, the native population of Courland, and their growing activity in commercial and social affairs, have unfavorably affected the prosperity of the Jewish community in Mitau. Moreover, the improved railroad facilities have made Mitau practically a suburb of Riga, which has attracted to itself most of the business once belonging to the former. On the construction of the Riga-Dünaburg railroad many of the prominent Jewish merchants of Mitau removed to Riga. 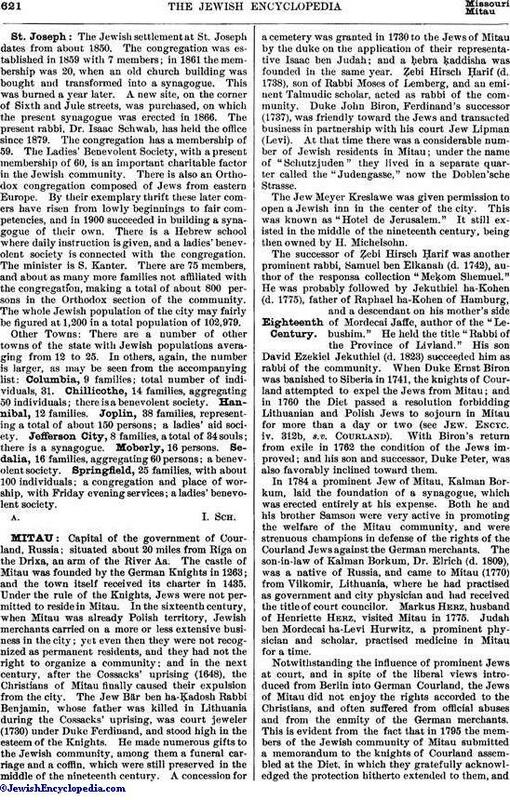 In 1904 Mitau had 8,402 Jews in a total population of about 35,000. See Courland. Wunderbar, Gesch. der Juden in den Provinzen Liv- und Kurland, Mitau, 1853.